(it's the first time Luca picked Nina up in his arms), he then threw a tantrum and said that he "hated" his little sister and wished "she went back in my tummy". Now... I know this is fairly normal behaviour when an older sibling gains a baby, but I just burst into tears. Post-pregnancy hormones, coupled with tiredness and breast feeding aches and pains just spun me out and I started weeping. Thankfully after a little chill out time on his own, he came out saying "I'm sorry". Bless him. We had a massive cuddle and he swiftly said "I love my sister, I just don't like her crying". It must all be so confusing for him... I mean, it is to us, as parents. One moment baby is safely tucked away in my belly, the next it's here, in my arms, wanting food, and cuddles and growing before our eyes. I think I will have some mummy and Luca time, doing what we both love to do best. This recipe for gingerbread can be used to make a whole range of decorations, gifts and, of course, gingerbread people. I get Luca to help roll and cut out the dough, and to decorate the biscuits. Preheat the oven to 170°C, gas mark 3. Line baking trays with baking parchment. Melt the butter, sugar and syrup in a medium saucepan, stirring occasionally, then remove from the heat. Sieve the flour, bicarbonate of soda and ginger into a bowl and stir the melted ingredients into the dry ingredients to make a stiff dough. Turn out onto a lightly floured surface and roll to a thickness of about 5mm. Dip biscuit cutters into flour before cutting the dough. 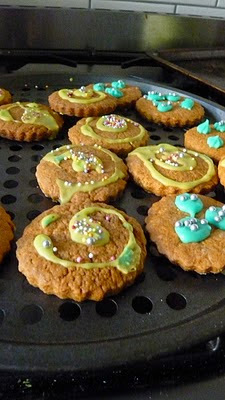 Place the shapes onto the lined baking trays and bake, in batches, for 9-10 minutes until light golden brown. Remove from the oven. While still warm, and using a skewer or chopstick, make any holes that you will need to hang up the biscuits with ribbon or to make a garland. When completely cool, decorate with the icing. 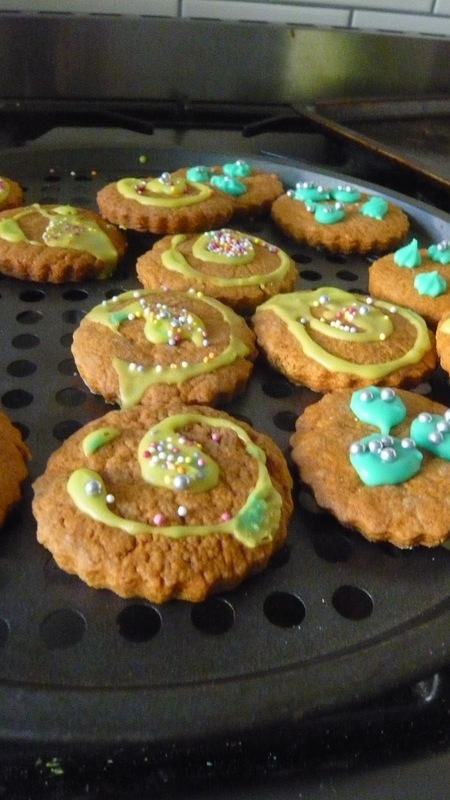 The gingerbread biscuits can be stored in an airtight container for up to two weeks.